There is a new watch on the block …. Suunto, the brand leader in functional outdoor instruments, announces the launch of the AMBIT*, the first true GPS watch for Explorers. 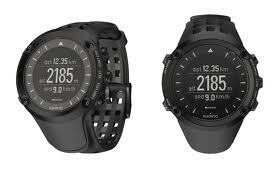 The Suunto AMBIT is what every backcountry skier, hiker, trail runner and mountain climber has been eagerly waiting for — a watch that combines a GPS navigation system, altimeter, 3D compass with advanced heart rate monitoring into a robust instrument for mountain and everyday use. With AMBIT’s full-featured GPS the user can choose waypoints to navigate with and see their location in multiple coordinate systems. The AMBIT boasts a host of other features including temperature, track logging, unique 3D Compass and barometric sensor. All these keep you informed of your location, altitude and weather conditions on your adventures. The AMBIT also offers functions for the serious mountain athlete. The patent pending accelometer fused GPS gives highly responsive speed and pace with Suunto FusedSpeedTM. 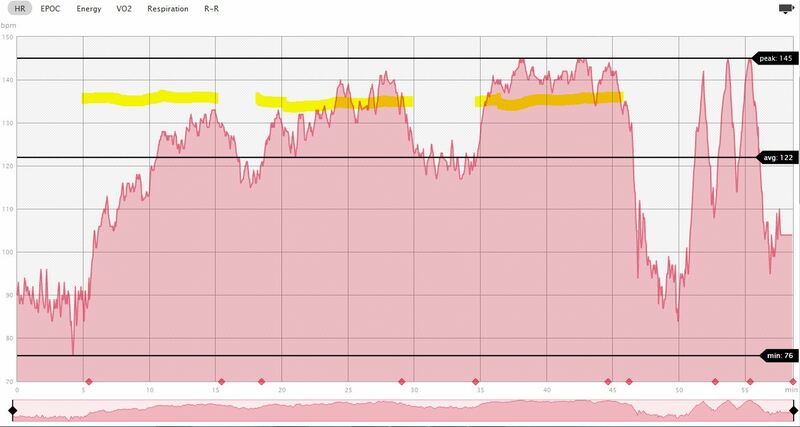 Heart rate monitoring with Peak Training Effect will keep you within your optimimum training zone and Recovery Time will tell you when you’re fully recovered for your next adventure. And after a hard session in the hills, the GPS will guide you home where you can upload your data for analysis on Movescount.com. The AMBIT is housed in a robust BuiltToLast casing and has an enhanced battery lifetime of up to 50hrs in GPS mode. True to Suunto’s heritage in dive instruments, it is water resistant to 100m. Upgrades are available through Movescount.com. Still recovering slightly from the injury but I have started spinning again. 1. 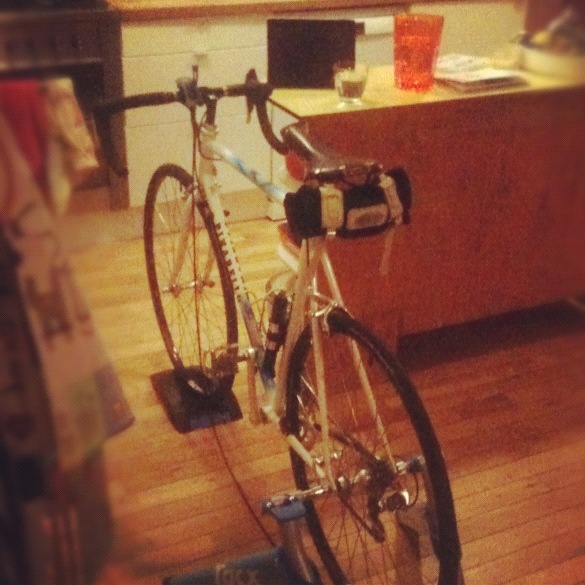 Assembled the turbo trainer in the house …. kitchen unit with iPad and movies on the unit …. wooden floors so easier to clean up the sweat. On polarpersonaltrainer website you can start following a program so I started an endurance ride one with sportives in the summer on my planned to do list …. 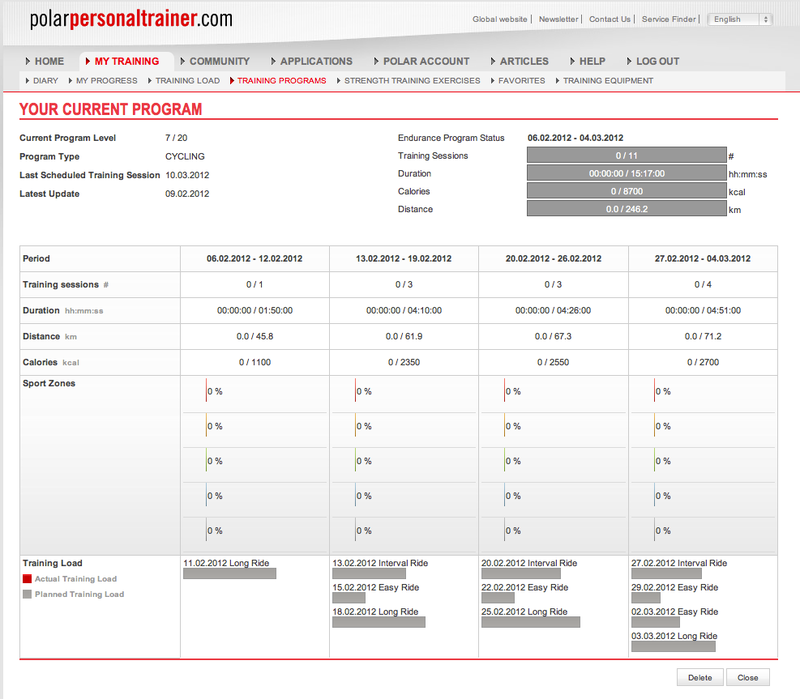 One thing I like about the site is that once your sessions are uploaded it works out a training load to avoid you overtraining. It is similar to Suunto’s Movescount Training Effect (I wrote a post about that here when i was using the T6 HRM). 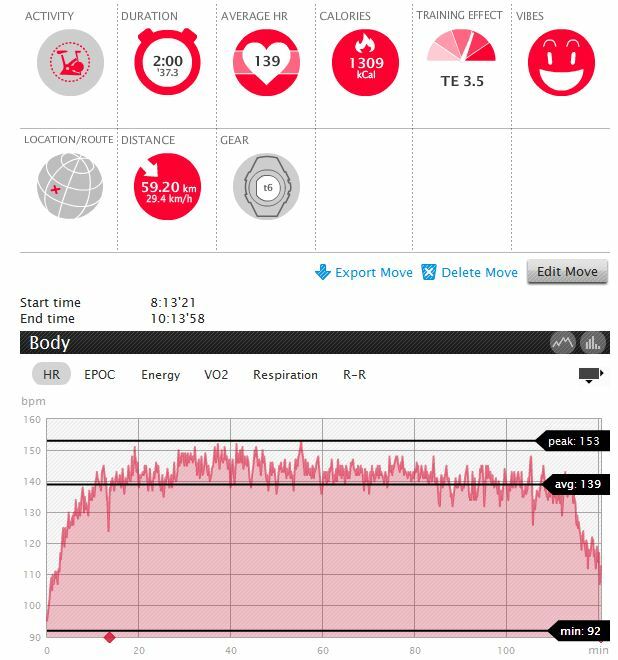 I started a training ride last night that said i had to do 30 minutes in Zone 2 HR which for me is only 127bpm max …. the summary is interesting showing the percentage of fat burn in the calorie expenditure … Basically long and slow burns fat …. will have to monitor this as would be great to drop 3-5kg for summer. It is hard to train for a slightly hilly Sportive when you are in the middle of a flat desert 5000km’s away from your bike. I am trying to keep my miles up on one of those Lemond static bikes and even have my cycling shoes and padded shorts with me so I can do some hours on the bike. 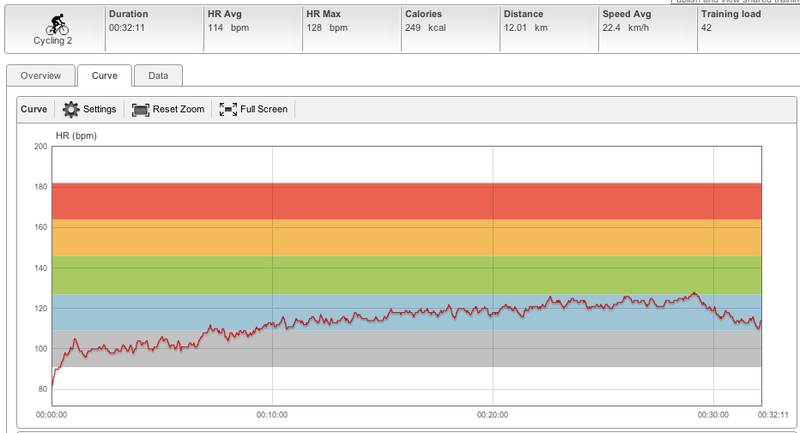 This morning was a shorter session – 2 x 15min standing hill climbs. For me that is tightening the friction until difficult to pedal sat down then stand up and dance for those 15min. Make sure you carry appropriate clothing with you. I would never ride this event without a rain jacket, especially in October. As a mid-summer ride, I’d probably still take a light shell for the descents. A gilet is an essential bit of kit, I’d urge everyone to have one, and I rarely ride without wearing one. Arm warmers, knee warmers, helmet and gloves are all essential too, just remember conditions can change quickly in the hills and after every climb comes a descent. Miles, miles and more miles! There’s nothing to substitute getting out there on the road. Try and make it sociable; head to a café with your mates, take in some hills on the way. Try and build up your distance over the weeks, with a combination of slightly harder short midweek rides and a long one at the weekend. The key is to enjoy it, that’s why you ride after all! 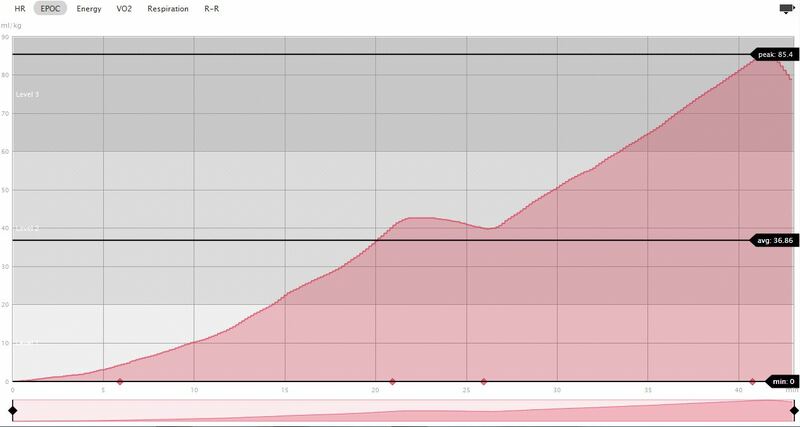 I would not advocate doing intervals for a long ride. The base miles from your rides, as long as you push it on the climbs, should be enough for your next challenge. Climbing varies from person to person, hill to hill. Some riders may be able to push a big gear in the saddle, while others dance on the pedals. Don’t forget climbs hurt everyone. It’s just how riders deal with the pain that separates the fast guys from everyone else – along with talent and training, but that’s another matter. The key point in an event is not to go mad on the first few climbs. Start off nice and steady, try and stay seated in a comfortable gear, concentrating on keeping a smooth rhythm. Keep an eye on your cadence, it’s likely it’ll be lower than when you are on the flat – but you also don’t want to be pedalling at 50rpm. Personally, I climb at around 80-90rpm in the saddle. There are occasions where you’ll need to get out of the saddle – again don’t forget you’ve got several climbs in the event, so don’t waste your legs on the first climb. Keep the gear low and don’t fight the bike. Staying relaxed on any climb is the key. This is a combination of your position on your bike and fatigue (I’ll get on to food later). Ideally you want to be sitting comfortably back in the saddle for these high cadence climbs, vary your hand position where needed, from the shifter hoods to the tops. It’s unnecessary until after you’ve crested the climb to be on the drops, this will just put more strain on your body. If there’s a headwind, try and keep in a group as there’s nothing worse than having the wind in your face with miles to go. Don’t get in a group that’s pushing you out of your depth right at the start though, you’ll only overcook it, get dropped and spend the rest of the climb/ride grovelling! Once again, a steady rhythm is essential. 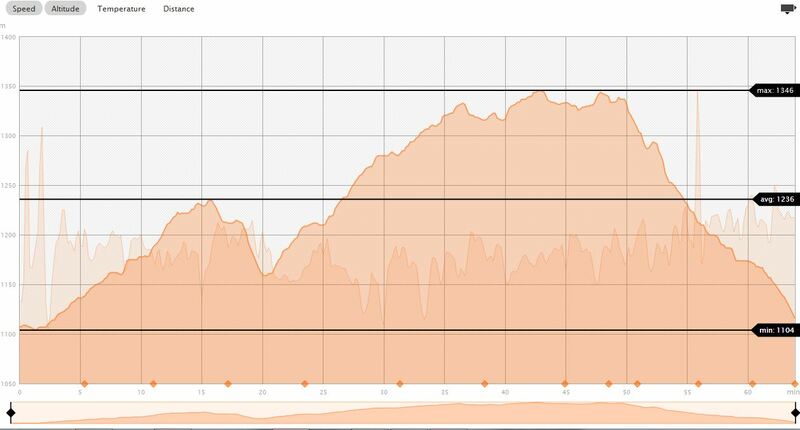 The target is the top of the climb, not a point 50m ahead of you. Use each crest or bend as an intermediate focus, but never forget the end goal. If at all possible, try and avoid getting off and walking on any climb, you’ll lose all rhythm and it’s not going to be any more fun pushing. A good solid breakfast will help you through the day; cereal, porridge, toast are best. If you must have a fry-up, don’t set off too quickly – give it sometime to digest! 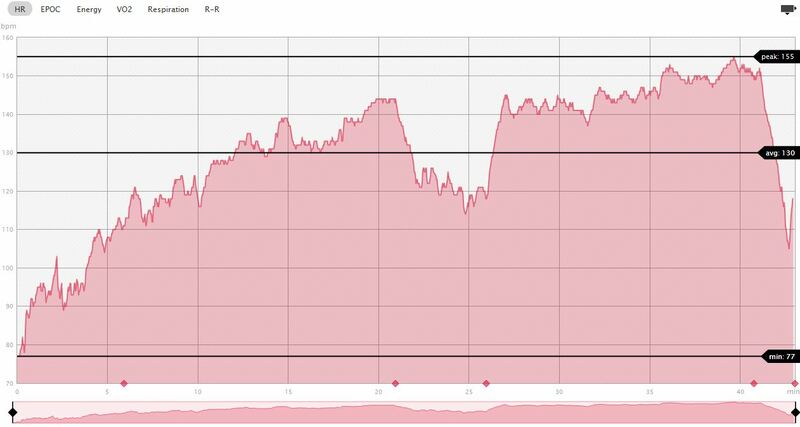 Check out the course profile before hand, as this gives you the ideal opportunity to fuel up before each climb. Try getting some food down you on any flat section and remember to stay hydrated before you hit the climbs. Eating is crucial, as you’ll be putting out much more power climbing. I’d suggest on a 100-mile event,to go with 80 per cent solid foods and 20 per cent as a back-up of gels. Although gels are easier to consume on the go, they do leave you feeling rather hollow and your stomach will always function better with some good solid foods in there. Use the gels as an emergency for when you’re near the end of the ride and you feel that ‘bonk’ coming on. Depending on where it’s sensible to eat, when racing I always try to eat every 30 minutes, give or take. A hard training ride, I might go an hour, but always eat before you think you need to and refuel once you reach each summit. I’d suggest using an energy drink too, taking a gulp every 15 minutes or so. Hopefully all these tips will help you succeed – and remember to smile it is supposed to be fun …. My training plans for the Sportive is based on a short training period – I am a finisher as opposed to front runner. I am already doing over 7 hours a week of cross training, running and cycling so planning on more specific Sportive preperation as opposed to exacting cardio. Intensity: The intensity level of training is deﬁned as ‘low’, ‘medium’ and ‘high’. In pre-season (and off season) the focus is still on low intensity work to continue building endurance and in particular increase your aerobic ﬁtness. This is the bedrock of sportive riding – developing heart and lungs so they can efﬁciently deliver oxygen to your working muscles. At this stage we also introduce some mid intensity work to start developing speed and the ability to sustain that speed. At mid intensity you’re operating just below your anaerobic threshold – the point at which your heart and lungs can no longer keep up with the oxygen your muscles need to function properly. This can be tested scientiﬁcally, or you can aim to be working hard enough that conversations are possible but in short sentences only, and you are never getting ‘puffed out’ (start to breathe/blow more rapidly to expel CO2) which is a sign of excessive CO2 production due to anaerobic activity. Cross training: Cross training is any non-bike exercise and it’s useful to ensure that this covers a wide range of muscle groups to keep you in overall good shape. One round-the-world cyclist said that all of his pre-ride training was on core strength, including arms and most of the upper body, because he wanted to avoid strain or injury from so many miles in the saddle. He said he got bike ﬁt once the ride began! Turbo trainer: Turbo sessions can serve a range of purposes – a standard session is a good low intensity steady ride when the weather is too bad or nights are too dark to go outdoors. Long interval sessions should be about 6-8 minutes at medium intensity followed by an easy spin at low intensity for 4 minutes to recover. With all sessions, aim to maintain a good cadence of 80-100rpm and a smooth, steady cycling rhythm. Today’s training was turbo training at low to mid-intensity. Had a friend on the bike next to me (in a gym 3000 miles from home and my bike) so the time passes really quickly. Hadn’t had breakfast so grazed a Clif Bar between 30mins and 1 hour into it so never felt hungry although Desert Roadie said he felt a gnawing hunger …..
Cycling over geared 55-60 revs per minute before riding up hill can closely stimulate sportive. You need to get use to being tired when riding up hill. Learn to spin your legs down hills, not necessary at 70 revs per minute but 10-20 revs keeps the blood flowing and saves your legs. 3 sets of 10min standing (I can barely turn the pedals sat down so I guess high resistance) at a cadence of between 58-65. Rest with about 4/5 mins in between of very low resistance spinning at 95-100 cadence. Been based in Frassinoro this break which is 1110m above sea level. Been doing lots of hilly runs and wishing I had also brought my mountain bike and road bike as there are amazing rides all around. Frassinoro is a bit famous for their cross country skiers – part of the trail is apparently an important training area for them summer and winter. Passed a girl this evening o the trail walk/ running with 2 poles and buns of steel – maybe she is the world champ?